The Warriors is one of my all-time favorite games - I have a PS2 mostly to keep it, and Red Dead Revolver, fully playable whenever the nostalgia hits me. Though "The Warriors" had no cinematic sequel, Rockstar was plotting a followup anyway, one set in 1960s Britain at the height of the Mods-vs.-Rockers brawls. Internally, it was called "We Are The Mods," said Matt Kazan, an environmental artist at Rockstar Toronto who left in 2010 and is currently the team leader on "No More Room in Hell," a Half-Life 2 zombie mod. Kazan posted some art samples showing period automobiles, a rifle and other props, and wrote about his work on it (as well as on Red Dead Revolver's sequel, which began as a PS2/original Xbox project). 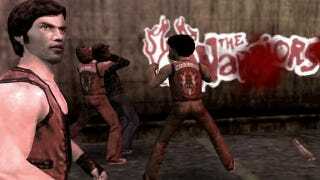 The project had begun as a PlayStation 2 spiritual follow-up to the earlier hit 'The Warriors', but part way through the development cycle Rockstar New York asked us to switch Mods from a Sixth Generation to a Seventh Generation development, changing from the PlayStation 2 to the Xbox 360 as the primary development platform. Much of the content here reflects that change, with Mods being the first Seventh Generation project the team had worked on. It was a learning experience for everyone involved. The game was similar in design and style to "The Warriors" but set in 1960's England at the height of the "Mods" vs. "Rockers" era. It's likely this project is dead, which is a shame. Rockstar's a big-projects company, and it's following up Red Dead Redemption with L.A. Noire and then, probably, Grand Theft Auto V or whatever that will be called. But even the binned ideas speak highly of that studio's creativity.